Even though many people love squirrels for their bushy tails, twitching noses and crazy antics, homeowners tend to tell a love-hate story when talking about these busy rodents. When they start going after your prized perennials -- like your hibiscus plant (Hibiscus spp.) or other landscaped plants -- it may be time to roll up the welcome mat and deter the problem behavior. A designated squirrel feeder may distract from your tender hibiscus. Squirrels feed on succulent plant material, including young, tender shoots; newly planted potted plants; newly transplanted plants; and those that keep green, tender stems. Unfortunately, many hibiscus plants, which grow in U.S. Department of Agriculture plant hardiness zones 4 through 11 depending on species and cultivar, have tender stems and plenty of green material for squirrels to feed on. Taste and odor repellents work by either leaving a bad taste in the squirrel's mouth or putting off an offensive odor. While many products line the shelves of hardware and general purpose stores, making your own homemade repellent may be the ticket. Capsaicin, a chemical found in hot peppers (Capsicum spp.) that creates a burning sensation on skin and in mouth when you eat them, works on other mammals as it does humans. Mix 1 tablespoon of hot sauce with 1 quart of water, and place in a spray bottle. Spray your hibiscus every three to five days and after rain. To boost the taste and smell repellent properties, chop one yellow onion and one jalapeno, add 1 tablespoon of cayenne pepper and add all three to 2 quarts of water. Boil for 20 minutes, then drain with a cheesecloth. Place in a spray bottle once cool and apply to your plants every three to five days and after rain. Exclusion is always the best and most effective manner to deal with pests, although it doesn't always favor the wallet or the eye. Making a cylindrical fence out of chicken wire, fence stakes and bird netting around your prized hibiscus will keep the squirrels away but may take away from the aesthetics hibiscus plants bring. If your hibiscus plants lie in a bed, you can make a fence around the bed using either chicken wire or metal garden fencing. Attach the fence to metal stakes placed 4 feet apart. Top the fence with an electric wire to deter pesky squirrels. Unfortunately, this option can be costly. Placing squirrel feeders around your yard and giving them a more suitable food source may keep these rodents from eating your tender hibiscus. Squirrel feeders come in various designs, from whimsical to purely functional. 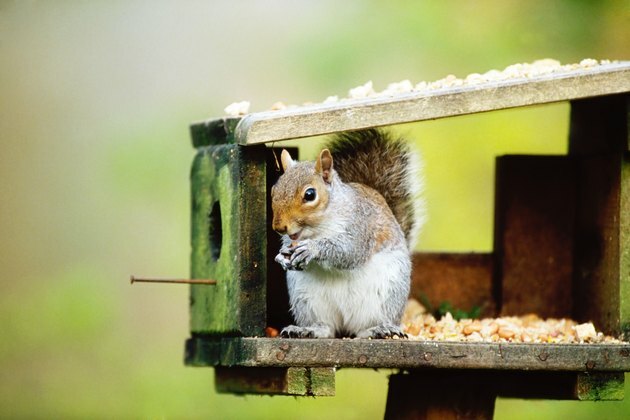 Sunflower seeds, nuts and corn make excellent choices for a squirrel feeder in your yard. Placing these feeders sporadically through your yard, or having a large one in a central location, may keep squirrels from your hibiscus and also from your bird feeders.